Dukha or Tsaatans people who domesticate reindeer and are natives of Russian Siberia and Khovsgol the northernmost province of Mongolia. Originally from across the border in what is now Tuva Republic of Russia. The Dukha are one of the last groups of nomadic reindeer herders in the world. They domesticate reindeer, use them as means of transportation, ride them and milk them to make their dairy products. In many ways reindeer considered as member of their family and treated respectfully. They say reindeer and Dukhans are connected spiritually and dependent on one another. If reindeer disappear, so their lifestyle and culture, customs will disappear as well. 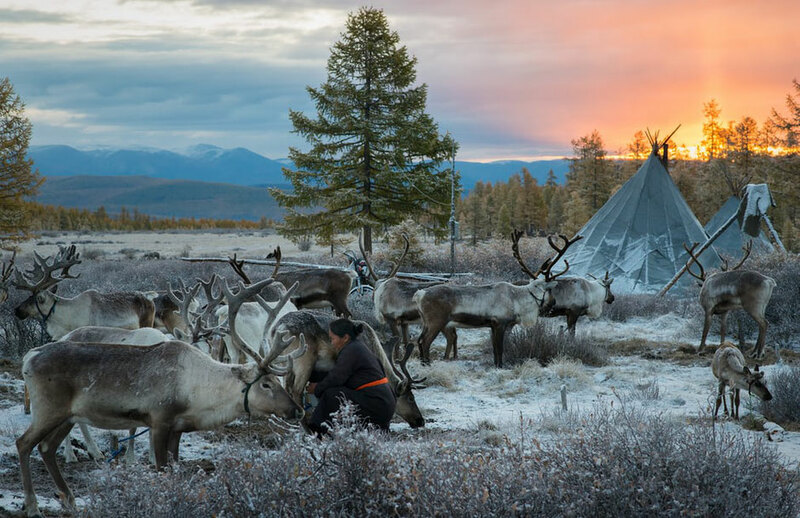 In Northern Mongolia, Reindeer People live with community of group of families together moving from one place to another to find optimum grazing for the reindeer. Herding tasks are shared with family members usually men and young boys are responsible to take care and look after reindeer. The women and girls do the milking and make cheese, yogurt and other dairy products from reindeer milk. Known as the Tsaatan people they live in an isolated corner of Mongolia, straddling the border with Siberia. These reindeer herders have been attracting international attention over the fast few years for their unique and unchanged way of life.